Thomas Merton observed that Gandhi’s spirit of nonviolence “sprang from an inner realization of spiritual unity in himself. The whole Gandhian concept of nonviolent action and satyagraha is incomprehensible if it is thought to be a means of achieving unity rather than as the fruit of inner unity already achieved.” Satyagraha in its sense of truth-force, or soul-force as Martin Luther King called it, could not be a means for overcoming division, unless it represented in itself the active experience of the unity of life; it could not secure a peace from without that was anything but the gift of its own being, a love rooted beneath the surface of things. For the satyagrahi each battle must first be fought in the soul—the battle against selfishness, attachment, passion. One could hardly begin the outer struggle—to wean the opponent from his or her selfishness, attachment, and passion, until the inner battle had been fought, and Truth had been victorious. The task was merely to re-enact that struggle on a larger stage. Truth never engaged in a struggle that had not already been won. Posted on 11 March 2014 under Catholic Worker Project, Economic Theory, Gandhi. The Indian consulate in New York City occupies a stately building off of Fifth Avenue. I was arrested for distributing leaflets marking the first anniversary of Indira Gandhi’s State of Emergency. I was charged with disorderly conduct and obstruction of government administration. “Which government might that be?” I asked hopefully. “Whose jail are you in, buddy?” replied my arresting officer. At that time, in India, tens of thousands of men and women were in jails and detention camps, among them the most active segments of the nonviolent Gandhian movement, for having committed crimes not much different than my own. And now, more than two years later, the dark days in India, which began on June 26, 1975, have passed. In the spring of 1976, Mrs. Gandhi gave six-weeks notice that free elections would be held, scheduled for mid-March. 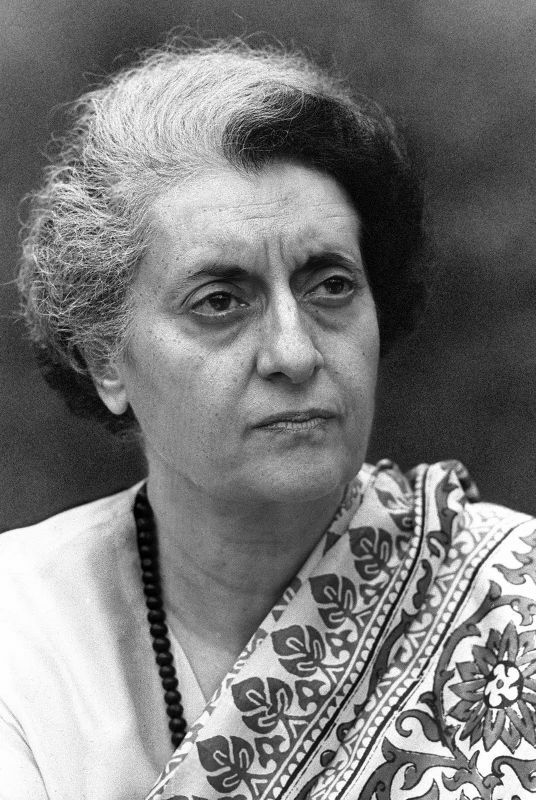 The announcement itself came as no surprise; Indira’s power was confidently entrenched, most of the provisions of emergency rule (which was maintained throughout the election) were long since codified in law, or established in fearful precedent. It was obvious that elections under these conditions would accomplish no more than to legitimize and cement the existing constitutional dictatorship. Posted on 11 March 2014 under Catholic Worker Project, Gandhi, Theory. On the day of India’s independence, the consummation of a lifetime of struggle, Gandhi did not participate with other Congress leaders in the celebration. That day for him was an occasion of deep sorrow, which he observed by fasting. India’s future lay in the hands of those who were determined to pursue the path of industrial and military strength, centralization of the means of production and political power, men who believed that India could be remade from the top down. As nonviolent revolution could not be the equivalent of violent revolution without the violence, but something qualitatively different in assumptions and goals, true swaraj (self-rule) could not be the parasitic apparatus of bureaucratic administration minus the British. Gandhi’s conception of swaraj was quite different: not the goal of an Indian nationalist government, but a process that would replace the state by the self-rule of each individual. 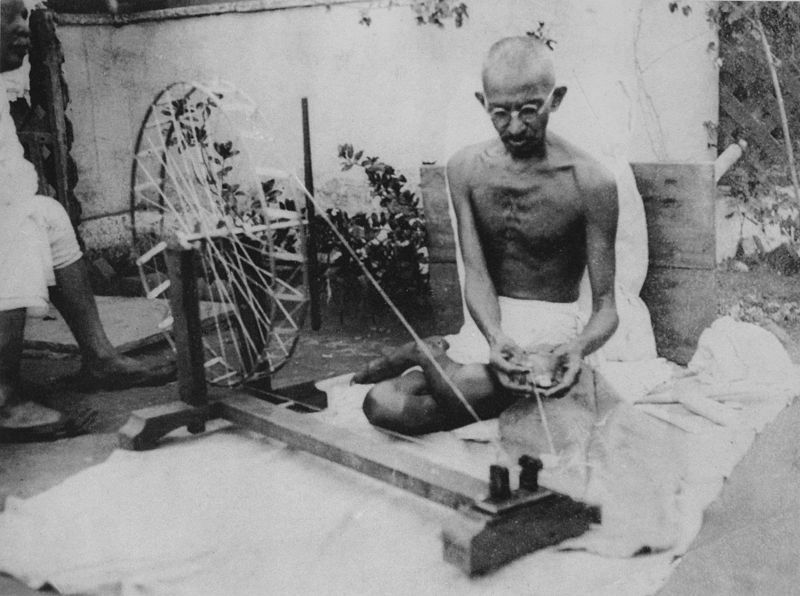 As the best function of school should be to enable the student to educate himself, the role of government, as Gandhi saw it, was to make itself more and more unnecessary, by enabling people to do without it; not simply by eliminating its functions, but by encouraging self-reliance, personal responsibility and devotion to social welfare, while dispersing the means of administration among radically decentralized institutions through which the masses might learn the art of self-management. A true Independence Day could not be represented by the arbitrary date of British submission, but that time when each individual was self-governing and self-sufficient for his/her basic needs. Swaraj was the rule of nonviolence, order arising from freedom, not to pursue selfish passions and desires, but to submit voluntarily to the law of one’s being. That freedom was not a privilege or right guaranteed by constitution but a perpetual call to the soul. Swaraj was thus a moral principle, which embodied certain political principles and economic conditions: decentralism, village autonomy, self-sufficiency, voluntary poverty, and bread labor; it was a philosophy of work. Posted on 25 February 2014 under Catholic Worker Project, Gandhi, Theory. I joined the strikers in Delano, now well into their fifth year of a frustrating battle, for little more than five weeks, and hardly claim to know in a real way what their hardship was. But my impressions from the experience were and are strong and lasting, and I would like to share some of them. I bussed up from Bakersfield to Delano through the flat commercial roads interspersed with long rows of vines. Delano appeared an ugly flat monotonous town devoid of woodland, crammed with the commercial clutter that plagues the landscape of America. I was later to learn that the railroad, which slices through the town, the planted orange trees and palms, and the long fields of vines on the outskirts were the only pleasing diversions for the eye. As I sat on the bench in front of the small Greyhound station, I felt increasingly defensive. Many drivers in the traffic I was watching turned their heads and eyed me suspiciously as they passed by. I became conscious of my long hair as in so many small towns; I wondered if they knew I had come to join the strikers. I stepped into the nearest phone booth and leafed through the book for the number of the strikers’ headquarters. It was nearly dark and the last rays of the setting sun were fading, a dark shadow of rusted red becoming more prominent, until, as I reached the U’s there was a large red blotch as of crusted blood over the United Farm Workers’ listing. Posted on 3 January 2014 under Catholic Worker Project, Constructive Programme, History, Strategy & Tactics. Crying out in behalf of the jail population of this country which is by and large made up of blacks, Puerto Ricans, Mexicans, poor black and poor whites, in other words the poorest of the poor, Fr. Dan Berrigan has been heard from during this last month when he was called as a witness for one of the Rochester group, who are the latest to destroy draft files in government offices. This group is one of the first to refuse lawyers (who must be paid sooner or later) except for one defendant who engaged only one – we presume, in order to call as character witness Fr. Berrigan from his prison cell in Danbury, Connecticut, where he is serving a long sentence with his brother Phil Berrigan, Josephite Father (dedicated to work among the blacks). Fr. 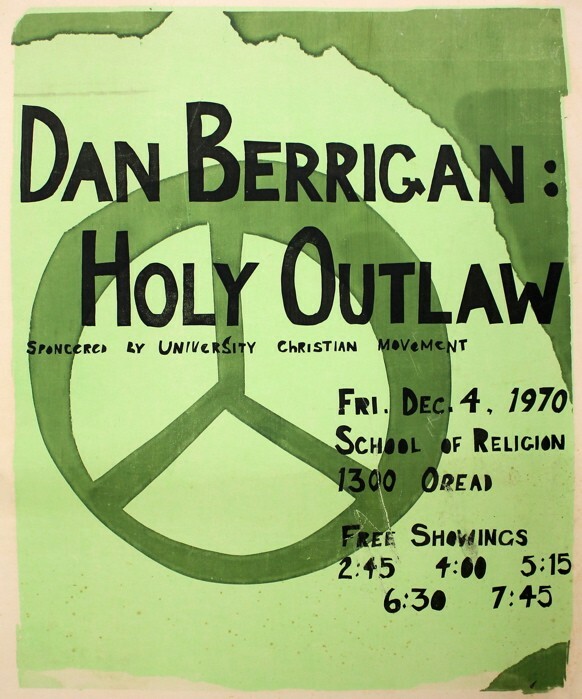 Berrigan was brought in chains to this upper New York State city where he was a character witness for Joe Gilchrist, one of the group. For some reason it took three days to transport him from Connecticut to New York State! He complained of the brutal and inhuman treatment he had received in transit. He testified also for all the prison poor in his protest. The other defendants are remarkable in a number of ways. Two of them, Suzie Williams and DeCourcy Squires, refused bail and spent their time in prison awaiting trial. The others all showed up, not jumping bail and failing to appear as did some of those who have taken part in these actions of destruction of property. Posted on 12 December 2013 under Catholic Worker Project, History, Pacifism, Strategy & Tactics, Women & Nonviolence. Dolores Huerta is one of the heroines of the by now famous grape strike which began in Delano, California, in September 1965 and which is still going on [January 1969] in the form of a boycott, from one crisis to another. 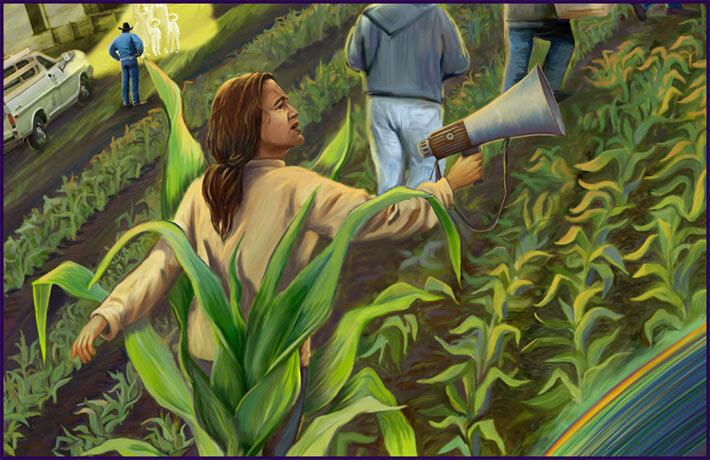 (1) There are many leaders of the farm workers all over the country, and I wish I could interview them all, in California, in Texas, in New Mexico, in the thirty cities of the United States where the weapon of the boycott is being used. 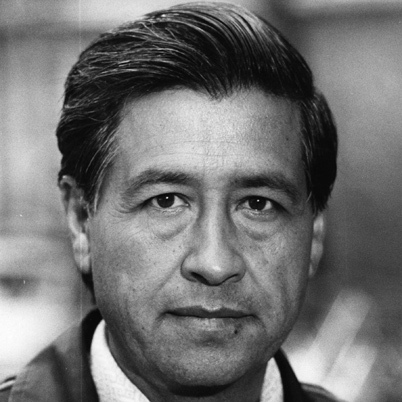 Cesar Chavez, head of the union, has been ill for some time and had to withdraw from active participation. He has been given worldwide recognition, and I would place him with the late Martin Luther King, Jr., and with Danilo Dolci and Vinoba Bhave, as an outstanding example of a nonviolent leader. We like to write about individuals in these movements for social justice, because, in a way, they are the word made flesh. We talk about what ought to be done, and here are the people doing it, putting flesh on the dry bones of principles and ideals. There must be the idea, the theory of the personalist and communitarian revolution, but the idea must be clothed with flesh and blood. Dolores Huerta, who came from Delano, is a young, strong, and beautiful woman, mother of seven children, and the leader of the grape boycott in the Manhattan area. A big job. A year ago five or six pickets began the work, going from store to store, up and down the streets of Manhattan, to the big Hunts Point Market, to the chain stores, to the boats that were bringing grapes from the West Coast, telling of the injustices done the farm workers, the conditions under which they had to live, their struggles for better housing, wages and hours, and demanding that they be included with other workers under the National Labor Relations Act, from the benefits of which they have been excluded from the time the law first went into effect. Our friends, Filipino and Mexican picketers, who shared our poverty in a flat on Kenmare Street last year, went back to their families in Delano for Christmas in 1967 and returned with a score or more of other workers, driving in a donated unheated bus to begin their Northeastern campaign in earnest. It is this group that Dolores leads. Posted on 12 December 2013 under Catholic Worker Project, History, Women & Nonviolence. 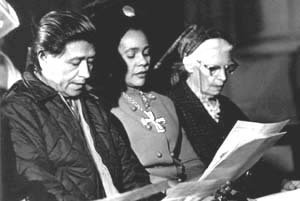 It was a thrilling sight last month [February, 1973] to stand on the steps of the Cathedral of St. John the Divine and to see the parade of the United Farm Workers coming up the steps, all those beautiful, dark, sturdy men, women, and children, dressed in those clothes in which they work in the fields, flags flying with the Mexican Indian eagle black against the red of their banners, led by Cesar Chavez and Mrs. Martin Luther King. I had been invited too, but I could not take that long trek from the Riverside Drive Council of Churches headquarters, thru the Columbia University campus, and down to 110th Street where the Cathedral stands, magnificent in its stately grounds, on a height looking East over the City of New York. I had enjoyed every minute of the evening before, and a fiesta held in the hall of the great old Paulist Church, surely one of the biggest in the city, where Marcos Munos (who heads the N.Y. office of the United Farm Workers) had prepared a party to greet the busload and caravan of ten cars which had made its zig-zag way across country from California. It was a pilgrimage to encourage the workers in various cities to continue the boycott of iceberg lettuce. Posted on 29 November 2013 under Catholic Worker Project, Constructive Programme, History, Women & Nonviolence. “Workers of the World, unite. You have nothing to lose but your chains!” This is one of those stirring slogans of the Marxists especially appealing to youth, no matter what kind of family they come from, upper, middle, or lower middle class. If it does not attract them to Marxism, it at least gives them a sense of community and relatedness to other sufferers and combats the sense of futility and frustration, which encompasses so many. 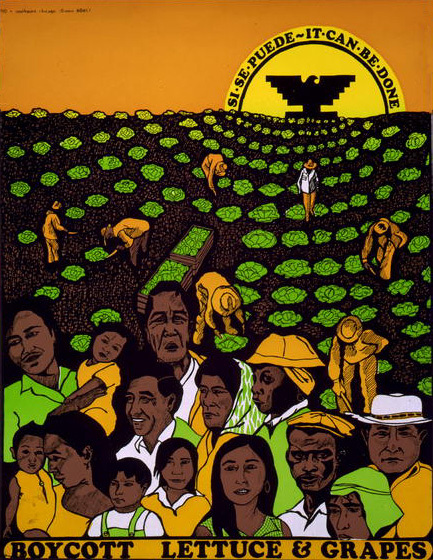 The agricultural workers of this country have long been the most abandoned and forgotten. They have been neglected in all Social Security legislation. From the first issue of The Catholic Worker, down through the years, we have written about the Negroes working on the levees, about the dispossessed sharecroppers of Arkansas and Oklahoma, the Mexicans in the onion fields of Ohio and Michigan, in sugar beets in the middle Northwest, about those who work in the potato farms in Maine, Long Island and New Jersey, in the turpentine woods of the South, about the citrus pickers of Florida, the Delta Negroes now being dispossessed from the cotton fields, and now the present strikers in California. The Catholic Worker has dealt with these stories and I have personally visited these fields of struggle. Posted on 29 November 2013 under Biography, Catholic Worker Project, Constructive Programme, History, Women & Nonviolence.